Happily, photographs taken at Turtle Rock Farm will be part of the monthly group exhibit at Scribner’s Art Gallery in Enid, Oklahoma, beginning Friday, October 3. If you’re in town around 7 p.m., drop in for the reception. It’s a festive night in downtown Enid – Oktoberfest – so there’s a lot going on around the lovely town square. (We’re so glad it still has one!) Scribner’s is located on the southwest corner, at 124 S. Independence. Sara and Shane Scribner, artists themselves, own and operate the gallery and studio, where they offer classes as well. Their energy and creativity is a great gift to the cultural life in the Enid community and we appreciate their appreciation of local artists. I am always so amazed to see how differently people see and experience events. Two people can watch the same thing on TV or be involved in the same activity and yet they retell the experience with totally different details. So much of how we experience life comes from our background and our belief system. Our families play the major role in shaping what we believe and how we see the world. These beliefs are hard to understand and even harder to change. They become a part of who we are. We don’t even realize why we believe what we believe; we just know it feels right to us. Our beliefs may be passed down from generation to generation, so there is much history. On October 25th and 26th Turtle Rock Farm will be hosting a workshop call Family Constellation. Family Constellation work allows our imperfect image of relationships and events to appear and be replaced by a more mature, more accurate image so we take our rightful place in the family. As we grow older and we see ourselves becoming our parents, we can learn how to choose the parts that we want to emulate and let go of the parts that we want to let go. 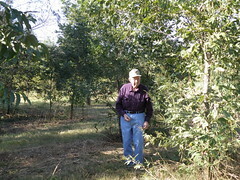 At the age of 72 our father planted pecan and walnut seedlings. It was part of a program which required planting 40 trees per acre. He planted 50 acres. I have always found it fascinating that he had the vision to plant trees that he might never see produce. The pecan grove experienced every set-back possible – grasshoppers, deer, drought, flood, early freeze and lack of attention. Every year Dad has had more trees grafted to make Paper Shells. Some grafts have taken, but many have not and have either died, returned to Natives or had to be redone. 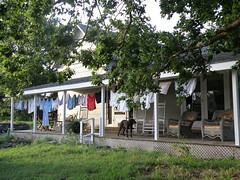 Sid, who runs the farm, has been busy with the wheat and cattle, and the pecan trees haven’t had lots of attention. So now the responsibility has fallen to us. My sister and I have started mowing and tending to the pecans. This week the ragweed was taller than some of the trees. It was challenging to drive the tractor with the bushhog through the heavy growth, down the rows and between the trees. But it is a labor of love. It is exciting to see the trees actually growing straight and tall and, for the first time, this year we will have pecans to harvest. Dad is 87. He will be at the pecan grove watching to see when they are ready to be picked and will eagerly pick the first pecan. the fog across the pasture. sleeps on that pillow case? arm with the peeling paint. helps me be still inside. The practice of silence forces us to deeper levels of reality. Deprived of distraction, we must either panic or come to a new kind of authenticity. To avoid the horror of existential isolation, we must open ourselves to experience our union with the natural world, with the human world and with God. slowly meandering across the hazy prairie. move silently in the breeze. but there is still stillness. Co-founder and board chair is David Korten, who has written The Great Turning: From Empire to Earth Community (his latest book) and When Corporations Rule the World. I like yes! magazine, which is edited by Sarah van Gelder, because it addresses sustainability issues and tells the stories of those who are not waiting for government or systems to change, but are out there living sustainably and doing justice and thereby threatening to change unjust, unsustainable systems. It’s a helpful – and hopeful – resource. It seems autumn – the time of coming in – is community time. In addition to the great reunion that is the Walnut Valley Music Festival in Winfield, Ks., (see posting of 20 September “How Can We Keep From Singing“) several area schools had class reunions last weekend, or will this coming weekend. Our local community had its annual festival – the Billings Wheat Festival, with food, crafts, entertainment and a parade. It is an occasion to get together as community. Lots of family and former residents make it back for this get-together. And, as it turns out, our monthly Sabbath Supper fell on this same weekend. 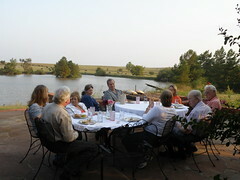 Neighbors and friends gathered for a potluck supper, good humor and good conversation on the patio overlooking the pond. Our purpose in the Sabbath Suppers is to bring together those who believe in our mission at Turtle Rock Farm – connecting with creation and learning to live sustainably – and to build community. Community time, along with Sabbath time, is one of those things getting lost in our culture. Too often there is too much to do to simply gather and eat together, share conversation, celebrate our existence on this amazing planet Earth. So, to friends and neighbors who take the time to come in and come together, we say thank you.